J-Link Commander (JLink.exe) is a free command line based utility that can be used for verifying proper functionality of J-Link as well as for simple analysis of the target system with J-Link. It supports some simple commands, such as memory dump, halt, step, go etc. to verify the target connection. The J-Link Commander is part of the J-Link software and documentation package, which is available for download on the SEGGER webpage. J-Link Commander allows to download data files of different types into the flash memory of the target systems. 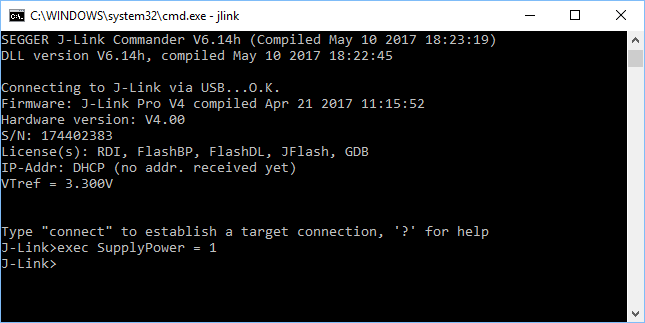 J-Link Commander executes the flash download and prints out the time statistics on success. Basically, some target configuration settings needs to be specified in J-Link Commander before a target connection can be established. However, the J-Link Commander comes with multiple command line options as well as a so called J-Link Commander Command Script mode, which allows using J-Link Commander in batch processing mode, so that it can be used fully automatic. -device <DeviceName> Selects the target device. -if <TargetInterface> Configures the target interface. -speed <InterfaceSpeed> Configures the target interface speed. -jtagconf <IRPre,DRPre> Configures the JTAG scan configuration of the target device. IRPre==-1 and DRPre==-1 can be passed to use auto-detection (First known device will be used). -autoconnect <Value> Value==1: Forces the J-Link Commander to connect to the target, automatically. -CommanderScript <ScriptPath> Selects a J-Link Commander Command file which contains the commands for the batch mode. -SelectEmuBySN <SerialNo> Selects a specific J-Link (via its serial number) to connect to. Used in case multiple J-Links are connected to the same PC via USB. The return value of the J-Link Commander application (JLink.exe) can be read out int the environment variable ERRORLEVEL. start /wait "J-Link Commander" "JLink.exe"
In order to use J-Link Command Strings in J-Link Commander, the native J-Link Commander command exec supplemented by one of the available J-Link Command Strings can be used. Specify the S/N directly via command line. See -SelectEmuBySN above for more information. The verifybin command in J-Link Commander executes a simple read of memory and compares the data against the data in the specified bin file. Note that *no* initialization of any flash interface etc. is done on this command. For external QSPI flash for example this means that the pins and the QSPI controller of the target MCU have to be already initialized etc. for this command to succeed. This is different for "loadbin" which may trigger a flash download implicitly where a flash loader is started that takes care of the initialization. Also note that executing a "loadbin" command in advance, does not guarantee that a "verifybin" succeeds because the loadbin commands restores the controller state after it is done. 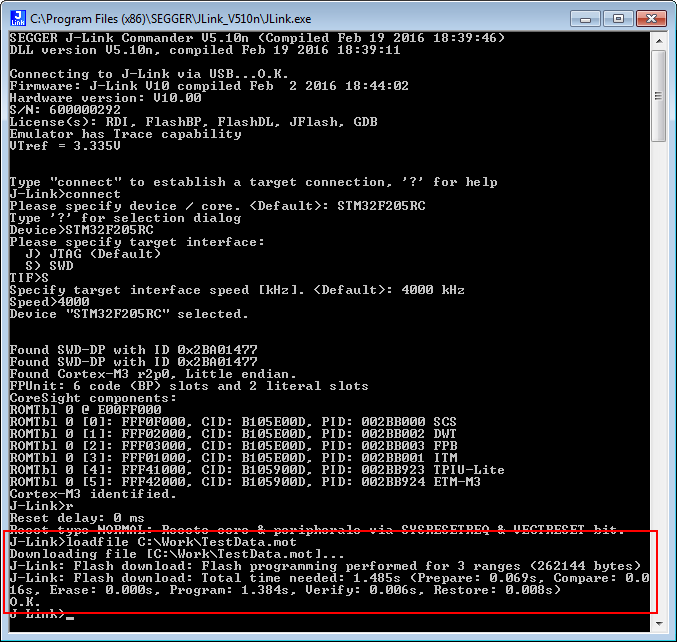 So if the QSPI controller and/or pins were not initialized before the "loadbin" command, they are not after it either. They are only available while "loadbin" is active.